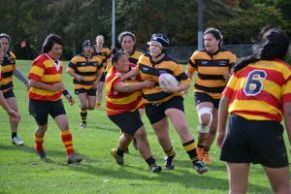 That was how Cross Country Rentals Eketahuna women’s rugby coach Sid Tatana summed up his team’s performance during their 17-5 win over Stokes Valley in a Wellington premier division match played at Stokes Valley on Saturday. Tatana, returning to the coaching role after “retiring” at the end of last season’s memorable campaign when Eketahuna won both the major interclub trophies up for grabs in the capital, was frustrated at the number of basic errors made by his players, especially their much-vaunted backline. “We struggled to get any sort of fluency into our back play. There’s a lot of talent there but they struggled with their combinations, they didn’t work as a unit,” Tatana said. The Eketahuna forwards applied themselves well against a bigger Stokes Valley pack with Perri Tatana-Williams leading the way from No 8. She was top value on attack and defence. Also impressing were a couple of young front rowers, Katelyn Donaldson from Tararua College and Daryl-Maree Reiri of Makoura College, the hard-running Lisa-Marie Ireland and Rebecca Mahoney, whose tactical kicking from first-five was a big plus. Eketahuna are second on the competition points table, behind only unbeaten Norths. Ruamahanga Colts bounced back to form in their Manawatu competition on Saturday, beating Freyberg 41-21 with a slick performance which belied the wintry conditions. Sean Robinson, Andre Kauika, Colt Pureau and Joe Dahlberg-Paku all scored tries with Dahlberg-Paku, who usually plays in the backs, adjusting well to the flanker’s role.